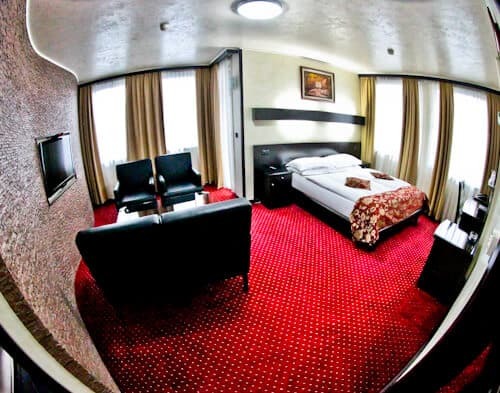 Visit the Prezident Hotel website for the best room rates. For the latest events and pictures check the Facebook and Instagram feeds. 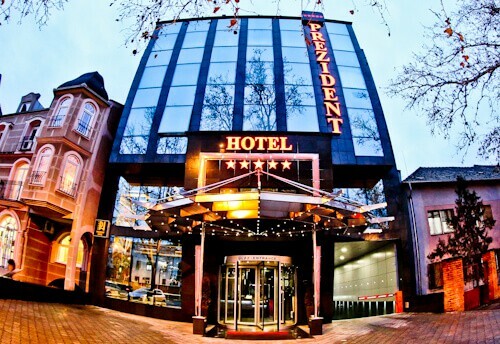 Hotel Prezident is located in the business district of Novi Sad. For those arriving in Novi Sad by car, you can make use of the secure underground parking. Although Hotel Prezident is aimed at business traveler, families and couples should consider this hotel for it’s 5 star facilities. Additionally, the center of Novi Sad is within walking distance. 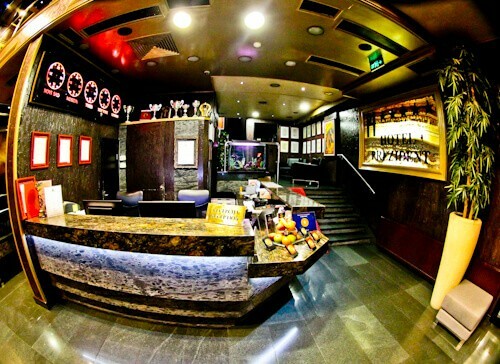 You will receive a warm Novi Sad welcome from the staff at check in. In addition you’ll get your first taste of the elegant interior of the hotel. It’s worth checking out the trophies behind the reception desk. The Prezident has won prestigious awards for it’s outstanding service and facilities. Anything you need from reception, they’ll be happy to help you with, it could be to order a taxi or for a city map. If it’s a good coffee you require, the bar is located next to reception. As well as checking in, you’re welcome to take a piece of fresh fruit with you. The guest rooms at the Prezident are spacious and homely. 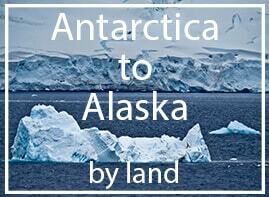 On the flat screen TV you have access to several cable TV channels in English. The complimentary WiFi is super fast with strong signal. There is a balcony for those who wish to smoke. There are several different types of rooms and suites available, as you can imagine, some of the rooms are very lavish which is why the hotel attracts famous guests from the Gucci family. There is a Jacuzzi available in the Wellness and Spa center but you may wish to enjoy one in your room as well. For those visiting Novi Sad as a couple, the hotels facilities will ensure you have a romantic break. For me, this bathroom was one of the best bathrooms I have seen in any hotel throughout the world. 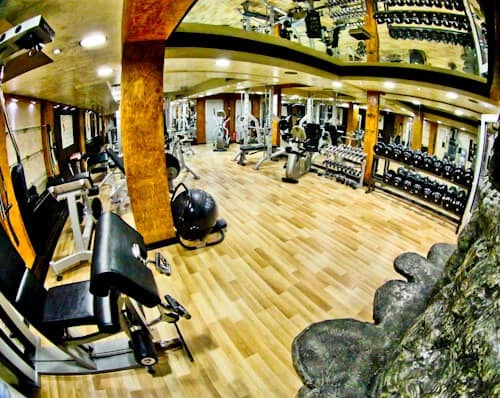 It deserves a special mention in addition to all the facilities of the Wellness Center. Guests have complimentary access to the swimming pools. 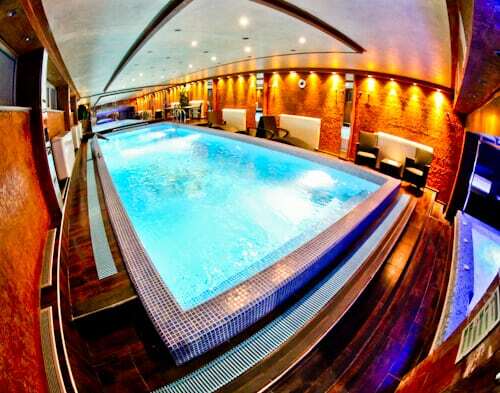 There’s an indoor pool which is perfect for the winter months (above). As well as the large indoor swimming pool, there’s an equally sized outdoor swimming pool. The outdoor pool is the pool of choice for those summer months. Indoor and outdoor Jacuzzi’s are also available for guests. In addition to the 2 outdoor Jacuzzi’s, you may enjoy the indoor Jacuzzi. 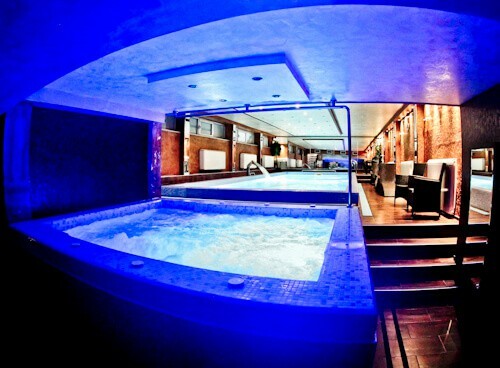 With a huge amount of Jacuzzi’s available it’s likely you’ll have one to yourself or to share with your other half. As well as the Jacuzzi’s in the wellness center you may choose a room with private Jacuzzi. 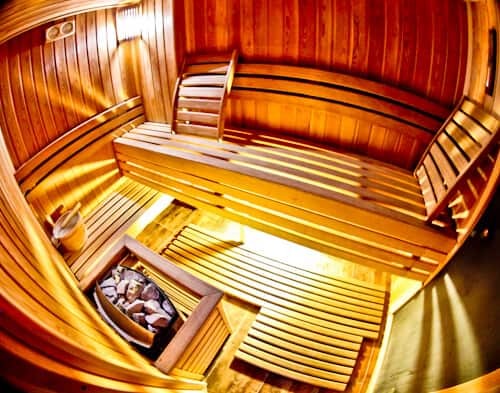 Those looking for a hotel with sauna in Novi Sad will be happy at the Prezident. The hotel offers complimentary use of its Finnish sauna for guests. In addition to the Finnish sauna, you have access to a Turkish Bath. The fitness center is huge, it’s probably bigger than your local gym back home. For those who like a serious workout, you can find heavy weights. For those who prefer a cardio workout, there is plenty of cardio equipment. In addition to the equipment, there are yoga mats and exercise balls. One thing I loved about this gym is how spacious it was and the mirrors. Mirrors are always useful when checking your form (or posing!). The choice at the buffet breakfast is huge. I was particularly impressed with the fresh salad options available. There were some Italian businessmen at the buffet who were very impressed with the Italian espresso coffee. Good coffee is essential for anyone traveling on business. For any additional service you require whilst enjoying the breakfast, waiters can assist you. 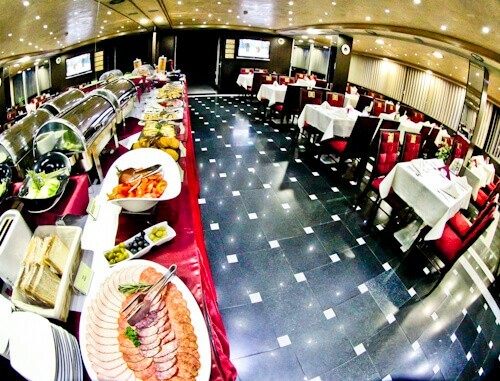 Alongside the breakfast hall is the hall of fame. Pictures of the hotels famous guests are on show here. Famous guests at the hotel include, Roger Federer, Patrizia Gucci and Nick Vujicic. It’s always interesting to see famous people who have stayed in the same hotel as you. For those visiting Novi Sad on business, you may use the conference room. 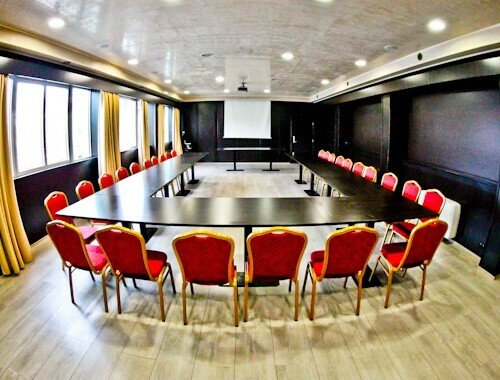 The conference room has state of the art facilities to fulfill your business requirements. 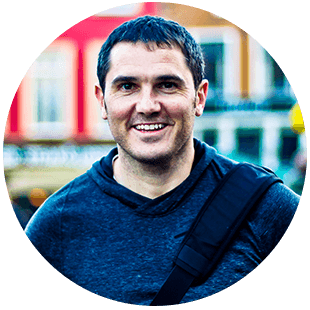 Of course the most important facility is reliable fast internet, and this is guaranteed. The conference room can be set up to accommodate up to 100 people, theater style. When I visited it was set up for a smaller meeting of 20 people (above). Coffee and snacks can be arranged during your business meeting and I can confirm the coffee is excellent. Prezident Hotel is one of those hotels when it’s a shame to leave the premises. There is so much to enjoy onsite, from a business and leisure travelers perspective. 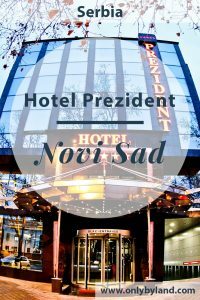 If you enjoy a Jacuzzi, a swim, a sauna, a spa, a massage, to be in a place where rich and famous have been, then I recommend Prezident Hotel in Novi Sad. In addition, if you enjoy a good coffee you should stay here! The gym at this hotel looks as good as my local gym. Being into yoga and stretching I’d definitely be happy here! I love the decor of the hotel, and I’m sure Gucci did too! Hi Joyce, I was impressed with the gym too!